When you need a custom print or scenic supplier, finding one with exceptional customer service is key. You don’t want to be stuck on the phone with an automated machine or a representative unfamiliar with your event when something changes or requires immediate attention on the day of the show. This is one of our fun recent shows. It is 16’ tall x 90’ wide wall with two 9’ tall x 16’ wide screen openings and includes a half circle wall that stands 14’ tall with a width of 30’. This is all ground supported sporting custom dye sub printing with custom magnetic lettering, adding a wonderful dimensional element to the design. The show had many fun elements that added to the challenge. There was a quick turnaround to produce the show on deadline, and a big difference in time zones. The show itself and our shop are based in Chicago, but the end client was in Europe, a full 8 hours ahead. Even with these factors, the show was a success and one of our favorites. But you don’t have to take our word for it. 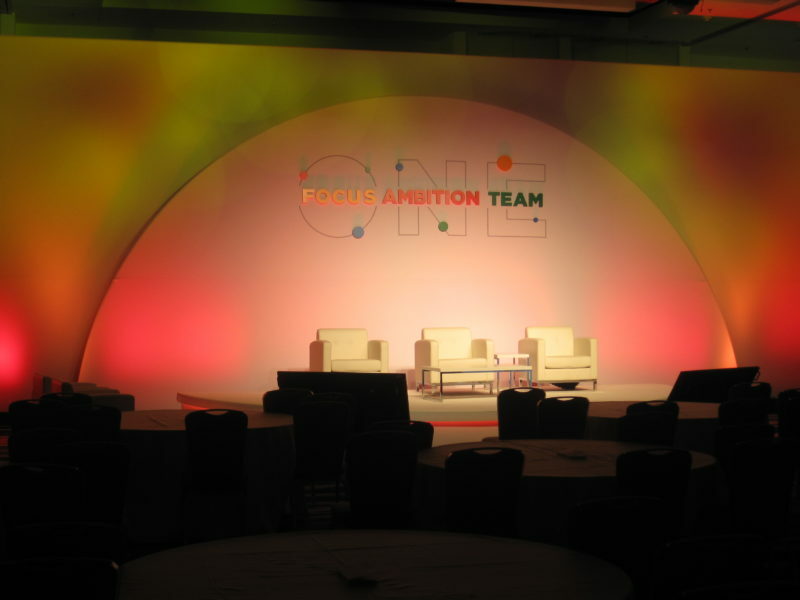 “I recently had an event that needed a rather large hard set with custom printing, and I didn’t get finalized specs until less than two weeks out. I didn’t even bother putting out quotes to different vendors, because I knew that the only company that could handle a request of this size in such a short amount of time was Expressive Structures. Ben and his team worked fast to provide a solution that included everything my client was looking for. Not only did Ben take care of getting all of the custom pieces for this under a very short deadline, he and his team were onsite for setup to ensure the set was installed to my client’s specifications. Expressive Structures is my go-to vendor for large-scale creative sets, and the product they provide, in addition to Ben’s fantastic customer service and attention to detail, is second to none. When the odds feel like they are stacked against you, it is important to have a scenic partner who understands how important the show is to you and your team and how to make it come to life. Let Expressive Structures be your production partner for your next scenic design.